To allow your location to be determined for 24 hours, click Remember my decision for one day. To block requests from this site to determine your location: click Don't allow. In the browser menu choose Safari → Preferences → Privacy. 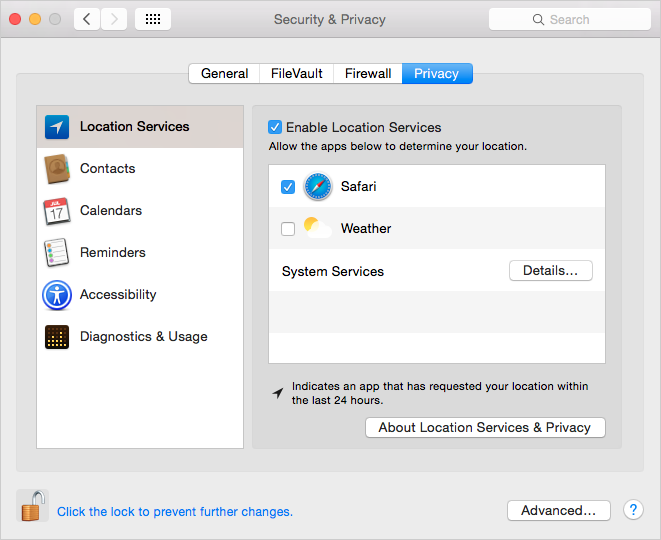 MacBook settings influence Safari and other programs' geolocation mechanisms. Click → System Preferences → Security & Privacy. Go to the tab Privacy → Location Services. To allow all programs from determining your location, check the box next to Enable Location Services. To prohibit all programs from determining your location, uncheck the box next to Enable Location Services. Uncheck the box next to the program that you don't want to allow to access your location.